A quiet place in which to get away and code is all I was looking for when I moved here. I found much more, but that's still the essence of the place. On returning home from the beach, I've just learned that after several years renting this house, I will soon have to leave, or buy it. 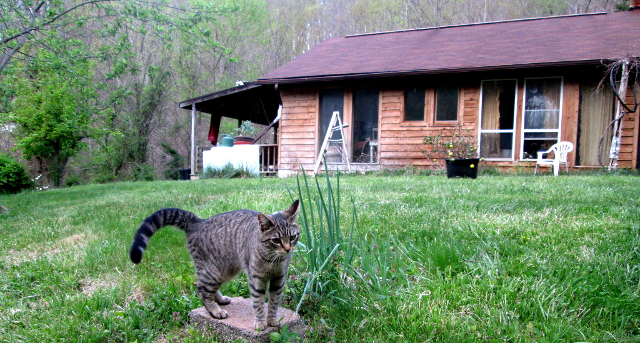 The house is an EarthShip, tucked away in its own private holler (as we say here in the Appalachian Mtns of Tennessee), below a mountain that is National Forest, two miles down back roads from a river. A wonderful place to relax and code, but developing only free software for twenty years doesn't quite stretch to being able to afford buying this kind of place. But, I got to thinking of times friends were able to visit me here. Grilling over wood fires with friends from Debian. Steep hikes and river swims. Sharing dialup bandwidth between our Linux laptops. A bunch of us discussing Haskell in the living room at midnight. And too, I've many times talked about the place with someone who got a gleam in their eye, imagining themselves living there. And then there's my Yurt, my relief valve before I moved here. And a great spot I like to visit on an old logging road above a creek. Could we put all this together somehow? Might a handful of my friends be able to contribute somewhere in the range of $10 thousand to buy in? Update: That was too much to hope for as it turned out. But, this post did lead to some possibilities, which might let me afford the place. Stay tuned.